Ms. Uberoi helps clients create, maintain and enforce their domestic and international trademark rights. Ms. Uberoi helps clients create, maintain, and enforce their domestic and international trademark rights. She manages multiple trademark portfolios across diverse industries, including media, technology, social media, software and mobile apps, online and brick-and- mortar retail services, apparel, consumer electronics, medical devices, entertainment, and cosmetics. She has developed and implemented comprehensive IP and brand protection strategies, negotiated and drafted complex agreements, and managed TTAB proceedings. Ms. Uberoi has extensive trademark experience in both boutique and “big firm” environments, as well as patent litigation and prosecution experience. 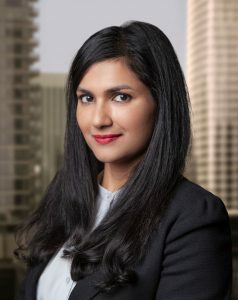 She also taught Legal Writing as an adjunct professor for several years at USC Gould School of Law and has worked as a bioengineer in the medical device industry.